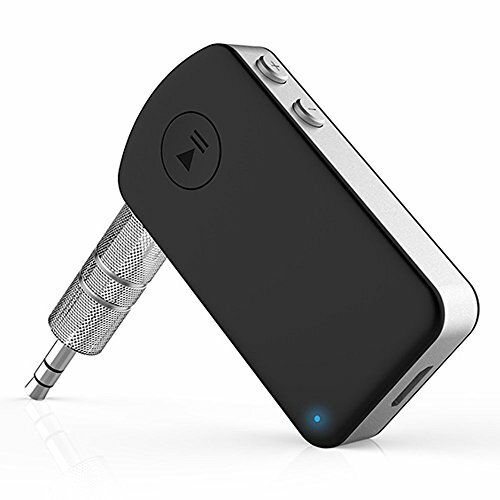 This BTI-030 Bluetooth Receiver, Enable Your Traditional Speaker or Wired Headphones or Car Stereo System etc Non-Bluetooth device with 3.5mm/2.5mm RCA port to have Bluetooth Function and then can be paired and connected ANY Smartphone/Tablet/PC via Bluetooth. So you can enjoy Hi-Fi Music wireless Now! NOTE: BTI-030 is not Bluetooth Transmitter, CAN'T be connected your TV and CAN'T pair to your Bluetooth Headphones/Speakers. Please search Friencity Bluetooth Transmitter on Amazon if you need. BTI-030 CAN SUPPORT PHONE CALLING? Yes, Enhanced calling experience, Hands free calling is clearer thanks to the improved microphone capturig more of your voice. HOW LONG IT WORKS CONTINUOUSLY? ▲BTI-030 provides up to 12 hours of continuous quality music playback. ▲BTI-030 will keep always on when you disconnect/leave it. So You don't turn ON/OFF FREQUENTLY! ▲Still Work while in charging. ▲Yes, and it can be re-paired and connected at once when you come back. HOW IS BTI-030 BLUETOOTH RANGE? ▲The WORKING RANGE is 33 FEET/10 METERS, you can control your music more conveniently! EASY TO SETUP, PAIR TWO AT ONCE. ▲Convenient Dual Connections function, you can play music from either of the two devices that are actively connected. NOTES: If you don't want Hands-Free function, please search Friencity J205 Bluetooth. 【ALWAYS ON FOR RE-CONNECTION】When you Charge this BTI-030 Bluetooth Receiver, it can't be turned off and will keep always on for re-connection next usage. So you don't need turn on each time. 【ENHANCED CALLING EXPERIENCE】Built-in improved microphone makes talking to family and friends a breeze. Perfect for hands-free calling when driving. 【EASY to SETUP and RE-CONNECTION】Big button design and easy to control, Plug 3.5mm audio connector of this wireless music adapter into a 3.5mm/2.5mm 2RCA port for your car/home audio system, non-Bluetooth home speakers and headphones and pair with your Bluetooth enabled devices to enjoy music, automatic re-pairing for a hassle-free experience. 【PAIR TWO AT ONCE】Friencity BTI-030 Bluetooth Receiver can connect two Bluetooth devices simultaneously. And it also could compatible with most smartphones, Tablet and Laptop, Wide Compatibility. Stream and control your music with a reliable connection from up to 10 meters 33-ft. If you have any questions about this product by Friencity, contact us by completing and submitting the form below. If you are looking for a specif part number, please include it with your message.